The Rev. Jean-Pierre Ruiz, S.Th.D., will lead a St. Mary’s University audience through a discussion of imagery presented in the book of Revelation on Wednesday, March 20. Ruiz will present “The Imag(in)ing Apocalypse: Revelation and the Arts of Interpretation” as part of the Escobedo Saint John’s Bible Lecture Series at 4 p.m. on Wednesday, March 20, in Reinbolt Hall’s Assumption Chapel. The lecture is free and open to the public. Ruiz — Associate Professor and Senior Research Fellow of Theology and Religious Studies at St. John’s University in New York — will discuss the highly visionary imagery filling the book of Revelation that, if understood literally, leads to bizarre interpretations of scripture that distracts the reader from its deeper and intended meanings. Apocalyptic literature, of which Revelation is a Christian example, contain a rich set of conventions that guide interpretation about elements, such as numbers, colors, visions and the like. Christians have long been fascinated with depicting passages in Revelation pictorially. 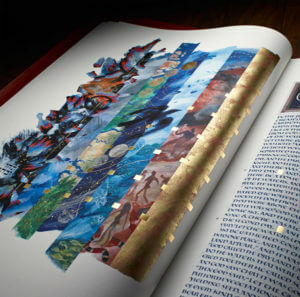 The Saint John’s Bible Heritage Edition — the world’s newest handwritten, hand-illuminated bible — is no exception. It is the first such bible to be commissioned by a Benedictine abbey since the advent of the printing press more than 550 years ago. The discussion will include an examination of St. Mary’s University’s full-scale fine art reproduction of the Saint John’s Bible.